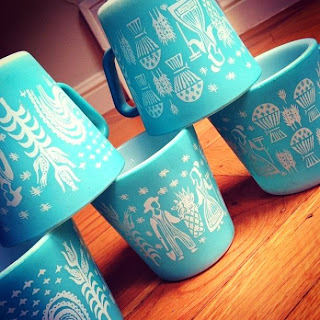 Farm Girl Pink....: ~ Pyrex - Butterprint in Turquoise... Coffee cups! ~ Pyrex - Butterprint in Turquoise... Coffee cups! 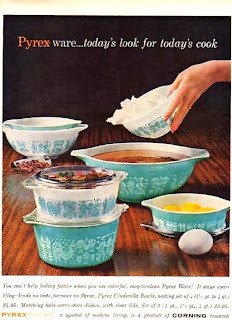 I can not think of a more common design of Pyrex... than Butterprint. Glorious turquoise Butterprint. I can remember practically every house I was in as a child, having a set of this turquoise beauty in the kitchen. Especially the mixing bowls. Be it the Cinderella bowls or the standard mixing bowls. These were plentiful. I wonder if Pyrex kept records with how much of this design was sold. 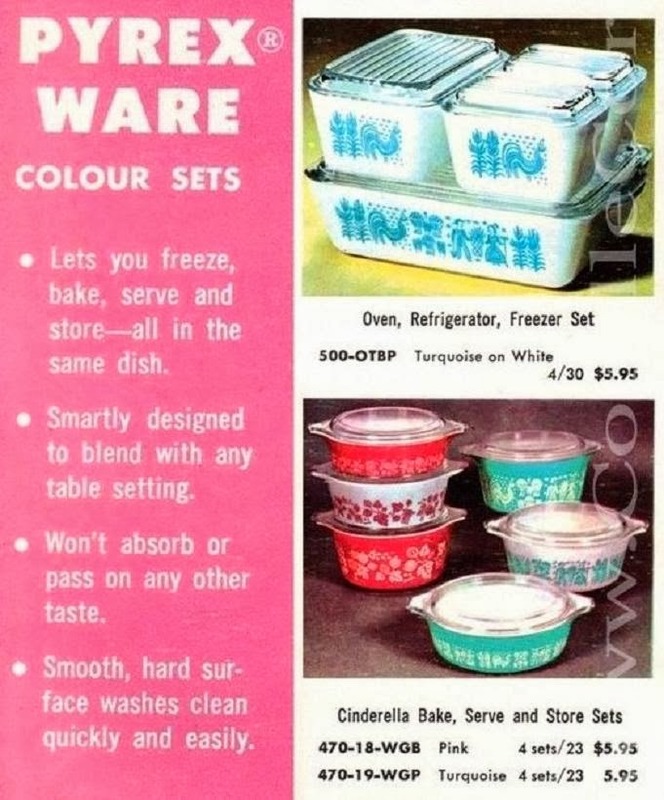 And then there is the sets of casseroles and refrigerator dishes. I have never seen these Butterprint coffee cups till this Summer. I saw two of them at a estate sale. In another female hands... who had no intentions of leaving them behind. I did ask politely to look at one of the cups. That I simply wanted to get a good look at the pattern. Which she kindly did let me hold it for a brief second. haha! 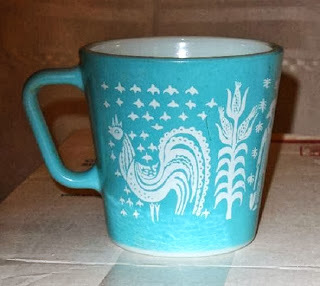 But I was just amazed that I had never even realize that Pyrex made these wonderful coffee cups. So you can understand that I promptly started stalking eBay, looking to see what kind of price these were carrying. And it is not pretty. My goodness those are so pretty! And sometimes in faded condition. With big prices. But dang it. I still want a set of 4. I see a future of me having to cough up more than I want to... for a set of these lovely blue cups. That is unless I see them at another estate sale for a dollar! Yes, those two coffee cups I saw this Summer... were .50 each. Those mugs...I've seen them before--only photographed! I'd do anything to get my hands on some! Someday. When we are randomly searching a thrift store or garage sale, we'll find some for mere cents...right? It will happen! SOMEDAY! I have never even seen a photo of them before. I'll keep my eyes opened for some. Something like seeing those cups in person but in someone else's hands for fifty cents apiece would seriously keep me awake at night. My stomach dropped reading this! You poor thing!! I am sure it was hard to see them in someone else's hands! If you saw them once I bet you will see them again. I know I will be looking for them also! So pretty! I have never seen them until now. I would love having a set of four or even one for my morning cup! When I first saw that lady carrying them, it did not sink in what exactly she had in her hands. I am drooling over those coffee cups. I didn't know such a thing existing. The only ones I see are the base woodland or green blossom or wheat patterns. I must look around. This is the pattern I collect and I LOVED reading your post! I was so shocked when I saw the mugs a couple months ago too! Thanks for ghe great link to the Ads, so neat! Happy Weekend. I'm currently in a dispute with Gramfeed over their improper caching of my image. I definitely don't mind if you use it on your page, just wanting a proper reference. Thanks! I am never speechless. Wow, incredible cups ❤.